Happy New Year to all. May dreams be realised and troubles kept at bay. Odd number new year so slightly apprehensive; but generally optimistic . A sad day for all us followers. During this time we have witnessed triumphs and sadness for the big and small trainers alike and of course, wonderful horses have been rightly on centre stage; Dawn Run; Best Mate; Moscow Flyer; Istabreq; Hardy Eustace and undoubtedly the best flat horse I never actually saw the mighty Frankel. The above is something we will never see again. In a straight mile at Newmarket , the first classic of the season for three year olds Frankel simply destroyed the opposition, making every yard of the running and at one stage was fifteen lengths clear of the rest. Astonishing. Greetings: Mummers Afoot: Birds Flying. Greetings and Salutations to one and all. The New Year of 2017 rapidly approaches and the joyful Christmas Season is upon us. 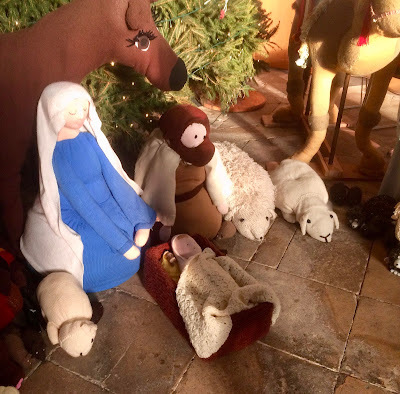 As you know in this Blog, we love a pun and thus it was whilst in Gloucester Cathedral last Thursday ( 22/ 12 ), my attention was drawn to these woven figures- called- -here it comes- "The knitivity," sew good says I.
Ladies, you did us proud, bless you all. Boxing Day, has always been a day for merriment and outside sports, including Morris Dancing and Mummers Plays. The above is a shot of the Gloucester Mummers performing their play outside Gloucester Cathedral on Boxing Day 2013. To complement this festive spirit, I bring you this poem written by my good friend L.
" As good as you, or any man in town "- Once a year, with his bag of cures for icy-pixy, palsy and the gout, tight looseners on the chest or wind on the knee, they'll prove just the same to such a one as he.